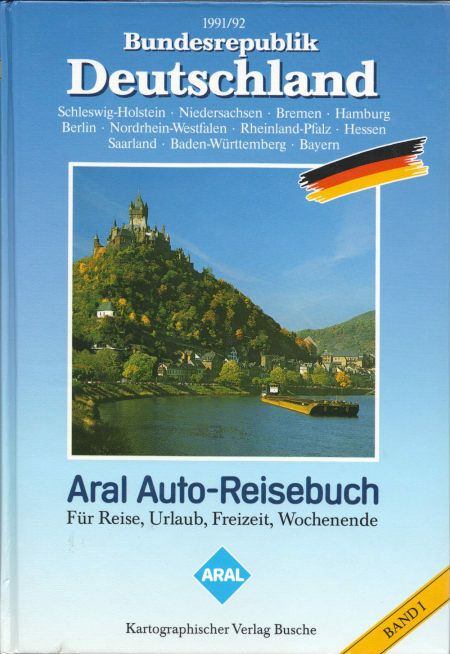 Aral has been Germany's largest brand of petrol for over 50 years and since the mid-1970s has regularly sold road atlases of Germany (or Germany with Europe), generally produced by its long-term cartographic partner Busche of Dortmund. 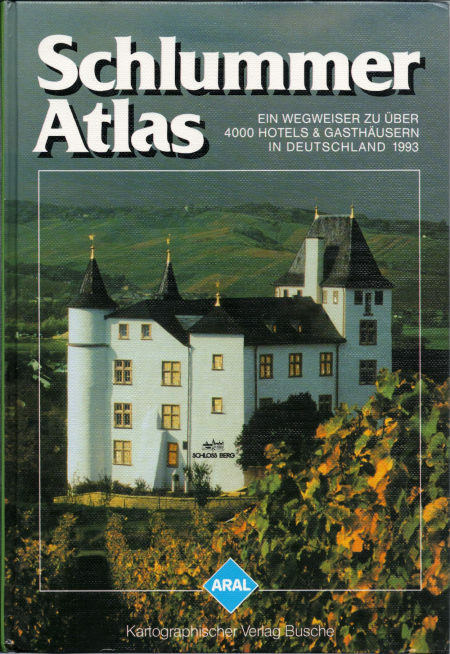 The 1978 hardback atlas (below left) used a design common to several years and had 660 pages, with detailed maps of Germany, Benelux, Austria, Switzerland, France & Northern Italy, and several hundred photos of tourist sights. 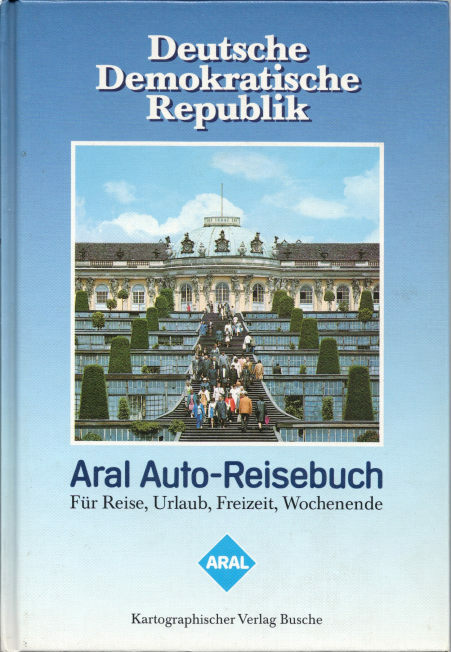 Aral also produced an alternative, smaller format atlas ("Auto-Reisebuch") of West Germany. Also featuring board covers, this edition ran to 648 pages (enlarge). The first half was devoted to single page maps covering West Germany at 1:400,000, with each map followed by between one and seven pages identifying the main tourist sites in the region covered, illustrated throughout with numerous colour photos. The second half of the atlas had 48 single page town plans (generally at 1:14,000, and all marking Aral filling stations), again followed by one to seven pages of gazetteer entries. The rear of the atlas included sections on road signs, radio stations, horse racing tracks and zoos, among others, plus a full place name index. 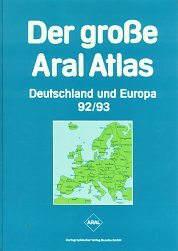 In 1986 Aral/Busche produced an atlas that was rather different and probably did not sell well, as the first edition appears to have been the only one. Called a "Städte-Atlas" of Germany and Europe (enlarge), it contained 75 city plans, each accompanied by between one and 5 pages of information about the city. However the choice of cities may have contributed to its relative lack of success, of the 75 cities only 19 were in West Germany, and it included ones that were almost impossible for West German motorists to reach, such as Moscow, Reykjavik and Valletta (Malta). The atlas was A4 in size with stiff paper covers and sold for DM16,80 - a considerable sum for an atlas at the time. By 1990 Aral had standardised on a hardback atlas of 230x160mm, so the internal pages were roughly A5. Each atlas was copiously illustrated with colour photographs in a gazetteer with most text pages facing a map page at the scale of 1:400,000. 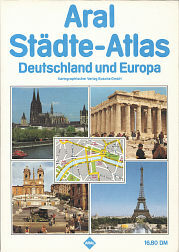 The 1990 atlas of the DDR (East Germany) was the third edition as travel between the two Germanies eased. 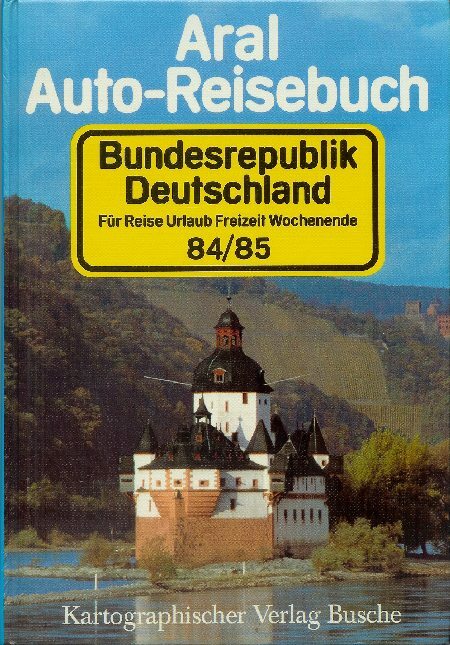 By the following year, the atlases reflected unification and were titled Bundesrepublik Deutschland - Band I & II - but the content was still split along the old borders, so volume I (the old West Germany), with over 640 pages, was more than twice the thickness of volume 2. In each atlas the first half is given over to regional maps and gazetteers, followed by detailed plans and descriptions of major towns and cities. 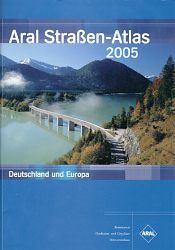 In parallel with its travel atlases (Reisebuch) Aral has for many years publishes a pair of guides under the names Schlummer-Atlas and Schlemmer-Atlas. The former is a hotel guide; its 1993 edition listed over 4,000 hotels while the latter covers restaurants. Its 1994 edition summarised over 2,000 establishments. 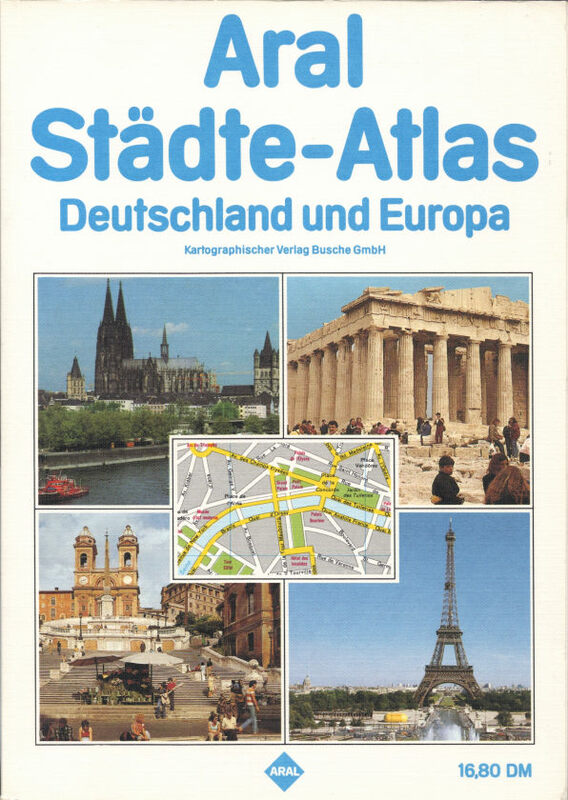 Both "atlases "had only rudimentary maps of Germany on the endpapers, but did include some of the same town plans as used in the travel books; the East Berlin plans shown below come from the 1991 touring atlas and the 1994 Schlemmer-atlas. 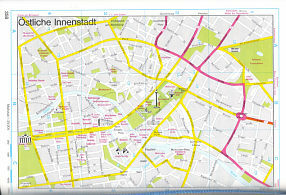 The 1991 atlas still showed a almost divided Berlin (far left); by 1994 main roads were again able to cross the city. Aral also published hardback atlases of Austria and, less commonly, France and the Low Countries. 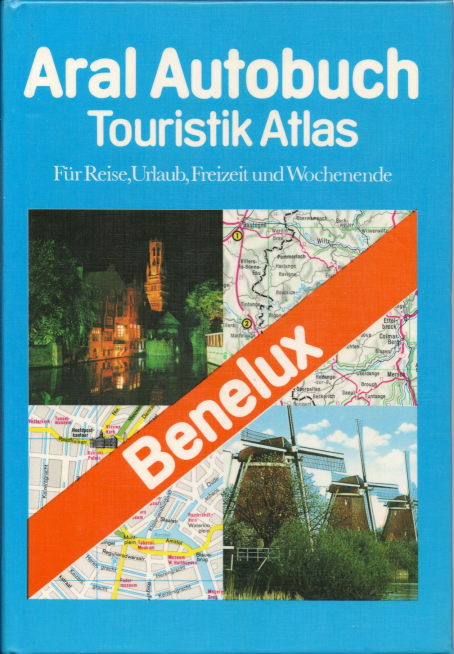 The first edition of Benleux dates from 1976 and follows the same pattern as the German atlases with regional maps at 1:500,000 interspersed among the gazetteer, and city plans and descriptions in the second half. 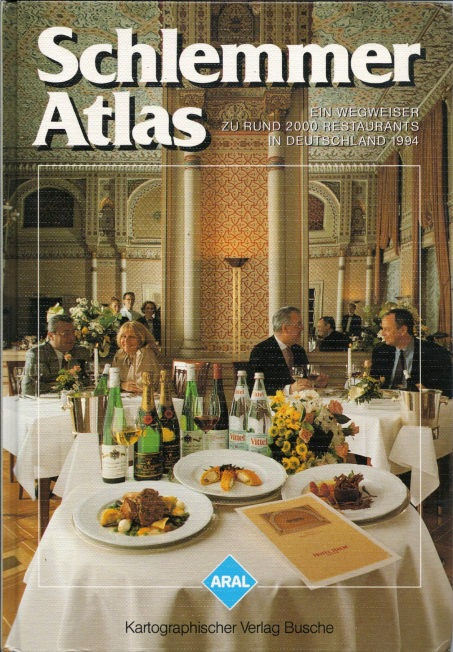 The 1985 (4th edition) atlas of Austria follows the same pattern. All maps were, of course, by Busche of Dortmund. The 1992 atlas was in A4 format, allowing the number of pages to be cut to 380. Following reunification, Eastern Germany was now at the same scale of 1:400,000; there were additional regional maps and 35 city plans with associated points of interest (but no colour photographs). For 2004, the atlas was switched to a spiral bound format, with new cartography at 1:200,000. This increased the page count back up to 544, including almost 60 pages of hotels and restaurants. The 1992 version marked Aral locations on all the maps, as it shared its cartography with Aral's sheet maps. 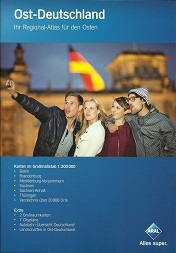 A companion 368 page spiral bound atlas of Germany/Europe was released in May 2004, but has not apparently been subjected to annual updating. Aral have also sold an A4 softback atlas since 1984, stapled rather than case bound, at a much lower price. 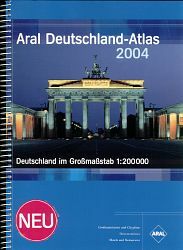 Sold (in 2006) for €7,95 as the Aral atlas of Germany and Europe it contains 176 pages, including 55 of Germany at 1:400,000 (with 25 city centre plans), Benelux at the same scale, Austria & Switzerland at 1:500,000 and the rest of Europe at 1:4,000,000. Space was saved by reducing the scale and number of maps of Europe and eliminating the gazetteer elements, but this remains exceptional value (especially when compared to the cost of a single Aral sheet map using the same cartography). With declining sales of sheets maps, Aral/Busche discontinued the expensive series of Freizeitkarten, but after a short-lived consolidation into regional maps, repackaged the cartography into four regional atlases covering E, W, N & S Germany. The East Germany example shown here (enlarge) dates from 2014, but was still on sale in Aral service stations in 2018. 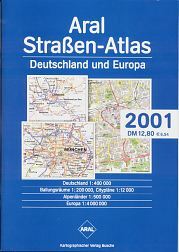 In addition to 100 pages of maps at 1:200,000, it contained a gazetteer with 20,000 place names, and six (not 7 as identified on the cover) city plans: Berlin (E/W), Dresden, Leipzig, Magdeburg, Rostock and Schwerin. Only the city plans marked Aral stations. However at €9,99 it cost little more than a single section of the sheet maps it had replaced. Aral's next national Straßenatlas was published in 2015, and - like the boxed sets of maps - was no longer clearly dated. 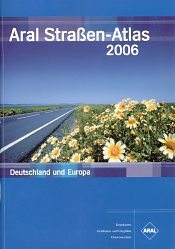 Aral have also issued A5 format road atlases of Germany under the name Tankstellen-Verzeichnis, primarily designed to help customers to find Aral filling stations. 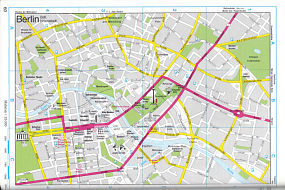 The 2001 example (left) was provided by Aral Card-Service GmbH, and had 21 pages of maps at 1:1,000,000 plus 14 pages of urban area maps at 1:100,000. Overall it ran to 128 pages, owing to separate lists of Aral stations suitable for trucks and of all Aral stations. 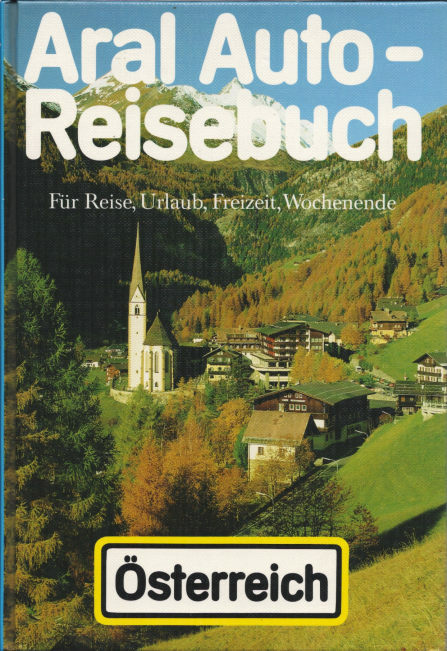 The 2003 edition (not shown) had a very similar cover to that of 2001, but had increased the scale to 1:800,000, requiring 30 pages of maps - by Kobel-Kümmerley + Frey, not Busche. The scale of the urban area maps had decreased to 1:125,000 allowing slightly wider coverage. This map booklet was sold for €1,50, and the inclusion of BP stations had expanded it to 146 pages. 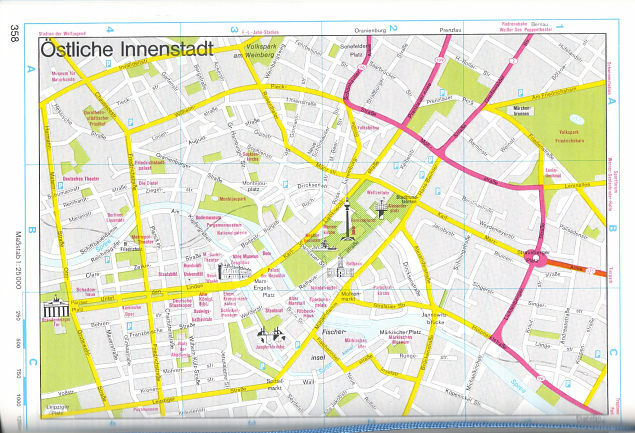 In 2004, the same underlying Kobel-Kümmerley + Frey maps were used to show Petit Bistro locations at Aral stations. This is the first known map from Aral that is not in blue covers, and it only marks the 1,100 or so Aral stations with Petit Bistro facilities; unlike its predecessor it had no cover price. In 2017-18, Aral appears to have had a programme of replacing Petit Bistro with REWE To Go stores. A range of Aral/Busche atlases, including the "Schlummer" and "Schlemmer" guides are still sold. Many are available through shops as well as larger service stations, and the Aral name is used by Busche to provide greater brand recognition, as its own products are less well known.